In this webinar, we discuss the importance of establishing a formal use case program to systematically onboard more data feeds, and use them to drive more security use cases. 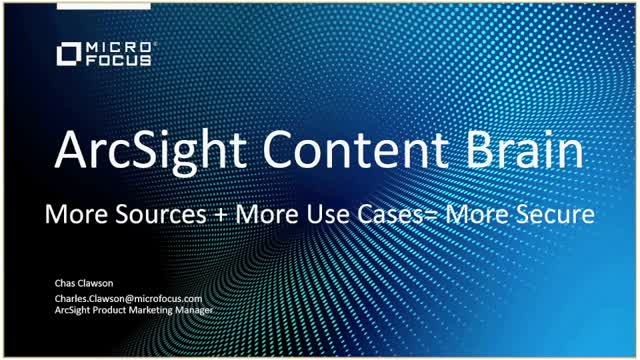 We also demo the exciting free web-based ArcSight Content Brain tool which provides you with many of the best practice use cases and ESM content to help your team find and plan out the deployment of our marketplace ESM packages. ArcSight has a long, storied history of protecting the world’s leading enterprises through enabling clear and comprehensive insights that help reduce damaging security breaches. Yet with modern digital transformation comes new challenges and threats. How do enterprises reduce complexity at a time of massive data explosion, scale to address a global range of threats and new application requirements, and reduce resource-intensive operations through greater efficiency by doing more with less? Hear from product and solution leaders about the core capabilities required for successful SecOps within a modern IT landscape, including the latest innovations to support today’s enterprise digital transformation roadmaps. Micro Focus is joined by Deloitte with customer success examples learned on their customer transformation journeys. This overview also includes an introduction to Interset for UEBA, Micro Focus’ newest acquisition, enabling advanced analytics for anomaly detection enabling Micro Focus to help its customers advance the next generation of security operations. Privacy represents a major challenge for the modern enterprise. The flexibility of hybrid IT and insights of data analytics are essential to business. But the digital transformation that is key to business success and competitive advantage is also a major vulnerability when it comes to data privacy. Organizations are rightfully concerned about CCPA, GDPR, PIPEDA, and the growing number of regulations now being enacted means they need to figure out how to reduce their risk. But current privacy protection approaches fall short. What’s needed is a unified technology framework that lets you take a holistic, analytics-driven approach to securing what matters most—a framework flexible enough to meet the needs of your enterprise, but specific enough to offer a guide to risk reduction. Ransomware is a global epidemic that is spreading like wildfire. According to the 2019 CyRiM (Cyber Risk Management) Report, ransomware could cause up to $193B in economic damage. The FBI estimates that ransomware infects more than 100,000 computers a day around the world. And in one example, The City of Akron, Ohio experienced public service interruptions, including disruption to the processing of credit card payments, as result of a ransomware attack. Organizations can easily neutralize the threat with a holistic 2-step approach by first strengthening protections against intrusions from the start, and by quickly resolving issues with an up-to-the minute copy of data needed to restore systems back to operational status, should the virus manage to get through. Implementing a holistic and integrated approach to minimize your exposure to risk makes good business sense. The Secure Content Management suite integrates file analysis, structured data management and policy-based governance to help you identify, analyze, manage, and retain both unstructured and structured data across the lifecycle. Cyber breaches have almost doubled in the past five years, according to the World Economic Forum, which now lists cyberattacks as third on its list of top global risks. But how can organizations keep pace, keep secure? There needs to be a plan! One of the clearest, most comprehensive, most flexible, and most highly-regarded methods we’ve found to approach cybersecurity is the framework devised by the National Institute of Standards and Technology (NIST). This webinar provides an overview of market trends facing organizations as they venture into a digital transformation. We will review how organizations can make their digital transformation secure by employing the NIST framework and ways they can to use it to strengthen every facet of their organization’s defenses against a breach. To help enterprises achieve an end-to-end solution that scales to meet modern privacy mandates such as GDPR, the California Consumer Privacy Act, and beyond, Micro Focus brings together comprehensive technology portfolios. This overview includes Secure Content Management for data discovery and classification; Identity and Access Management to capture and enforce user rights for safe access to sensitive data through identity governance; and Data Security for applying data-centric protection through innovative format-preserving encryption. The flexible solution supports a wide range of use cases to meet organizational maturity needs through a modular approach that grows along with your organization—learn more! With software becoming the competitive differentiator for most businesses rather than just a support function, the speed and complexity of it is rapidly increasing. Because of the business demand being put on development teams, often times there is little to no time put into ensuring these applications are secure. However, the biggest and most severe data breaches that have affected both the public and private sectors all operate at the application layer. Ensuring the privacy of your customer information and IP is critical for protecting the lifeblood of your enterprise. But where to start? Micro Focus offers a comprehensive framework approach that maps products and technologies to each phase of your strategy. Whether just starting out with data discovery and classification to determine your risk, or if ready to apply controls and audit compliance, our security, risk and governance solutions scale to your needs, each step of the way. Begin to unlock new business value safely when data is trusted in the hands of appropriate users and applications, while lowering risk of abuse or loss. This privacy solution overview will illustrate how you can begin your journey! Do you know how Android Enterprise device management works in ZENworks? What a Work-Profile is? How you can manage a company-owned Android device? Join us for this session where ZENworks architects take you behind the scenes of what’s actually happening during Android Enterprise enrollment with Google, how you enroll an Android device, how Apps get distributed, how you can enforce compliance with corporate security policy and control various device configurations. Join UEM Product Management team for this session and see how ZENworks 2017 Update 4 furthers your ability to manage mobile devices better and the improved client management capabilities. Learn more on the latest mobile device control settings, ability to distribute Wi-Fi configurations on iOS and Android devices, Enterprise iOS Apps, mobile hardware inventory, locate a Windows 10 device, install schedules in bundles, updated application & storage device control in ZESM and much more. As organizations realize that today's users expect their digital interactions to be convenient, seamless, and above all secure, demand for new types of authentication heightens. In this session we’ll talk about the new ways organizations are using the latest authentication technologies and how they’re preparing the future. One of the biggest challenges organizations with hybrid infrastructures face today is managing access across their complex and disparate systems – specifically privileged access. In the name of productivity, privileged access is provisioned to identities who need to perform administrative tasks. Those identities with elevated rights bring the most risk to an organization because they have the ability to do the most harm if their credentials are stolen or misused. This is why organizations must seek out solutions to get their privileged identities under control before they face a major data breach, network incident or, at the very least, a failed audit. However, employing the principle of least-privilege, where identities only have the correct level of access (no more, no less) can be difficult. This session will discuss best practices for privilege management in a hybrid world and how to reduce risk with a comprehensive, identity-based approach. Whether you have already implemented Office 365 or are considering the move, this is a session you don’t want to miss. Organizations who transition to Office 365 as part of a hybrid strategy experience a common set of management challenges. Many struggle to effectively manage privileges in both their Azure AD and on-premises Active Directory. The fact is that challenges around user provisioning, policy enforcement, and governance can prevent you from realizing the full value of your hybrid approach – and open your organization up to unnecessary risk. This session will describe five ways that you can more efficiently and securely manage your cloud and on-premises environment to get more return on your investment. This session will look at how to use the Microsoft Deployment Toolkit in conjunction with ZENworks 2017 Update 3 to deploy Windows 10 to your enterprise. This session will be presented by Todd Laycock and Oscar Sanchez, two of our most experienced engineers who are helping customers do this in their real-world environments. Come and find out what’s happening in Endpoint Management at Micro Focus. This session will be presented by Jason Blackett and other members of the Product Management team. They will discuss the upcoming product roadmap for products including ZENworks, Service Desk, Desktop Containers and ZENworks Mobile Workspace. During this session, we’ll introduce you to modern-day data security challenges. You’ll learn how Micro Focus Voltage can help you to overcome these challenges, while also improving operational efficiency, compliance, and revenue generation. How do you help your employees when they call your help desk and are having a problem with their mobile device or a mobile application? Have you ever wished you could just see what the user was seeing? We've heard from many of you that you need a solution that helps with achieving shorter problem resolution times for your mobile help desk team. This webinar introduces NotifyRDS, a mobile support solution from one of our trusted partners, Notify Technology. NotifyRDS delivers real-time screen viewing for iOS and Android (as well as remote control on some Android devices) with a simple application that can be deployed via ZENworks 2017 to your mobile devices or even used standalone. This is an opportunity to learn about NotifyRDS and how it can meet your needs. Join Jason Blackett, Micro Focus Director of Product Management for ZENworks – Endpoint Management solutions, and Paul DePond, President and Founder of Notify Technology, for a look at this solution. Do you have mobile platforms in your organization? Are you interested in eliminating usernames and passwords on iOS, Android and Windows mobile devices and tablets? Register today to hear from Brent Kynaston, Principal Solutions Architect at TriVir LLC, a Virginia-based Identity and Access Management (IAM) integrator, and Kent Purdy of Micro Focus. With the industry’s broadest set of integrated Security, Risk, and Governance solutions, combined with deep domain expertise and industry-leading analytics, Micro Focus is uniquely suited to help organizations take a holistic approach to protecting identities, apps, and data. Very few vendors can assure security and governance professionals that they are protecting against breaches, guarding the privacy of individuals and their data, and complying with regulatory and jurisdictional regulations – at scale, with ease, insight and confidence. Visit Micro Focus Security, Risk, & Governance at: https://www.microfocus.com/en-us/trend/security-risk-governance.